By David K.M. 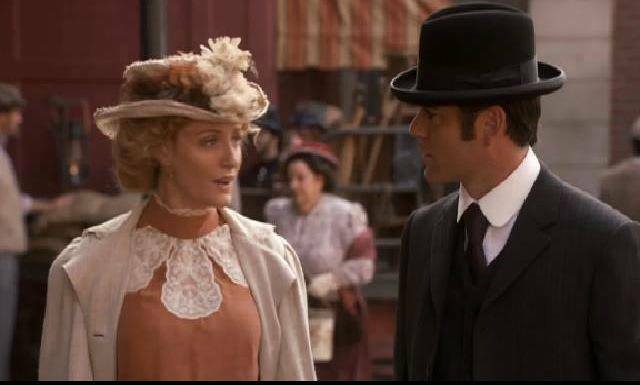 Klaus: I found Murdoch Mysteries by following disparate links, always one of the great things about the Web. It looks like great fun. Seasons 1-6 are on Hulu, 1-7 on Netflix, and 1-8 on Amazon, and I suspect you have at least one of those services; also on DVD and Blu-ray, and there are connected webisodes, in which the viewer is invited to solve the case through clues in each one. This Wikipedia page includes Canadian availability since it is a Canadian show, with Australian, British, and even French availability. There is a definite science-fictional element as this is set at the turn of the 19th-20th Centuries, yet Murdoch invents prototypes for cases or foresees more modern devices using the technology of the time — sonar, microwave ovens, airships, bit-mapped graphics using a letter-number coordinate color code on a telegraph to send a fax, Silly-Putty (! ), even the game Clue. There’s a subplot in which one character, a police constable, spends an entire season trying to write a fantasy novel. There are two cross-overs with future (that is, now) detective shows through two different means. Guest characters include Arthur Conan Doyle, Mark Twain (portrayed by William Shatner), H. P. Lovecraft, Harry Houdini, Jack London, Nicola Tesla, Thomas Edison, the Wright Brothers, Alexander Graham Bell, and more. There have been many guest stars who have been in sf genre shows such as Colm Meany, Victor Garber, Trenna Keating, Aaron Ashmore, Samantha Bond, David Hewlett, Robbie Arnell, etc. It’s even had Colin Mochrie, who described himself as the last Canadian actor who hadn’t been on the show before (not actually true, but close), like one theater actor of whom I read who described himself as the only New York actor who had never been in an episode of Law & Order. It hasn’t had Benedict Cumberbatch, Julian Glover, William B. Davis, Adam Baldwin, Alan Tudyk, or Jewel Staite, but if the show is on long enough, they will be inevitable because the show will be running out of actors. It has had Canadian fan Yvonne Penney, who won a walk-on role and appeared in two episodes. Yvonne is in the background between Julia and William (pink hat). If you already know all of this, sorry, it’s just that even though it’s been Emmy-nominated in the U. S., I never heard of it before and I’m looking forward to watching it. After the sudden death of Sir Arthur C. Clarke last spring, Yvonne Penney created a book of condolences to be sent to the Clarke family and circulated it at conventions for fans to sign. The Penneys brought it to Ad Astra and at Corflu Silver, then Apogee Books publisher Rob Godwin took it to several space conferences. Thanks to Lloyd Penney for sharing the story. The aim of the feasibility study is to establish the ways in which the hospital can be developed to play a significant part in social and cultural life locally. The study will look at the possibilities of incorporating a library, exhibition and museum space, and community arts space, study rooms and offices. It will also explore whether the works and theories of Minehead-born author, Arthur C Clarke, can be celebrated, and there will be scope to look at commercial and residential aspects of any proposals. And I believe the image above is a picture of the hospital.